The most targeted advertising in the industry with over 4 million page views per month. From designing to scheduling, just tell us your requirements. Our experienced team handles the rest for you. Advertising packages start at only $300 per month. Thank you for your interest in advertising with PCGS. Your email is very important to us. We have received the information you have provided and will respond within 1 to 2 business days. Promote your business, coin inventory or upcoming auctions to the most active and diverse coin collecting community. 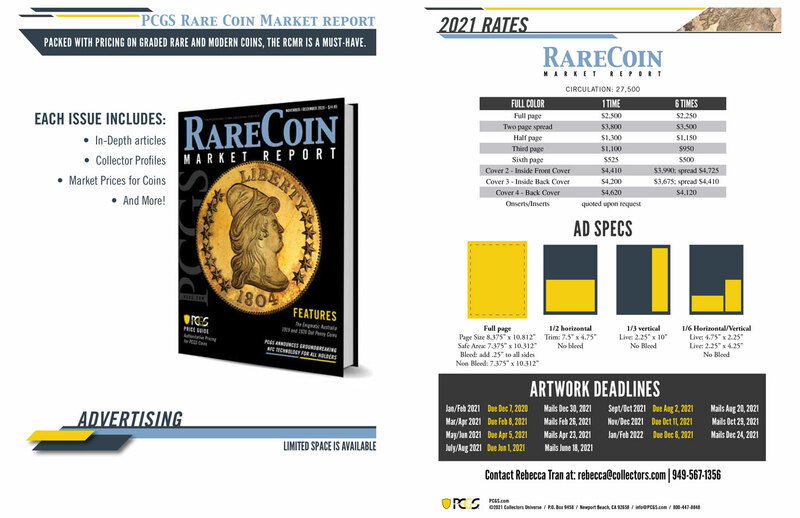 This comprehensive price guide magazine is published bi-monthly and is mailed to PCGS Authorized Dealers, Collectors Club and Registry members and distributed at major tradeshows. Promote your sale or auction to over 60,000 PCGS subscribers, including Authorized Dealers, Collectors Club members and Set Registry members. Geo-targeted distribution also available. Distributed to over 20,000 subscribers every other Tuesday. Advertise by sponsorship of article or custom feature in this e-newsletter. Send customized emails matching your website’s PCGS-graded coins to over 13,000 active Set Registry members with over 88,000 registered sets. Be featured as an Authorized Dealer in the top section of PCGS.com/dealers and again within individual specialties. Available exclusively to PCGS Authorized Dealers only.